Why do problems emanate in the South, even if you discount Greece (Deep South)? For the purposes of this post, South comprises France, Italy, Spain and Portugal, respectively the second, third and fourth largest Eurozone economies. North considers Germany (the largest EZ economy), Belgium, Netherlands and Austria. 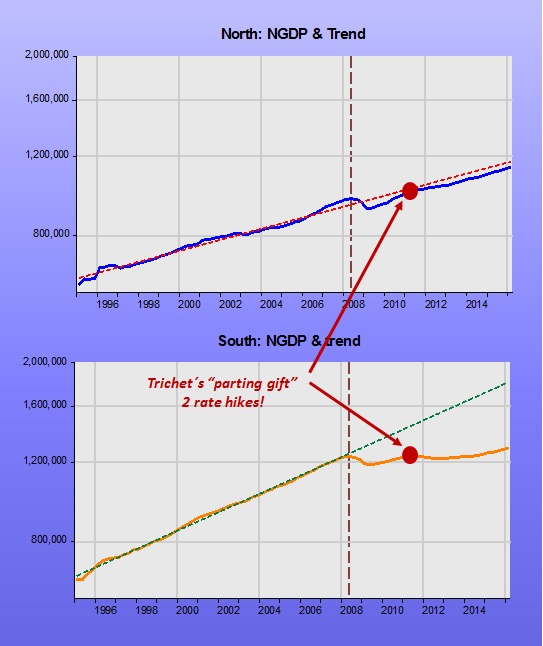 In 2006, spending (NGDP) in the South was 28% higher than in the North. Today, it is only 14% higher! These eight economies make up 91% of Eurozone NGDP, both in 2006 and today. Let me try to head off some comments that might talk about individual countries. As far as the ECB is concerned, the health of individual countries (including Germany) is TOTALLY irrelevant. 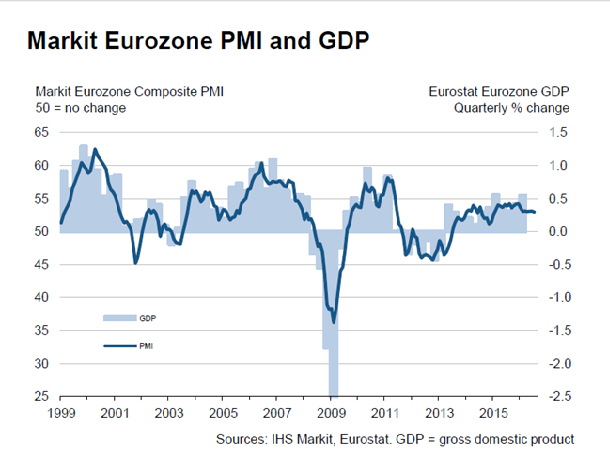 What matters is the Eurozone as a whole, where monetary policy has been and is still far too tight. 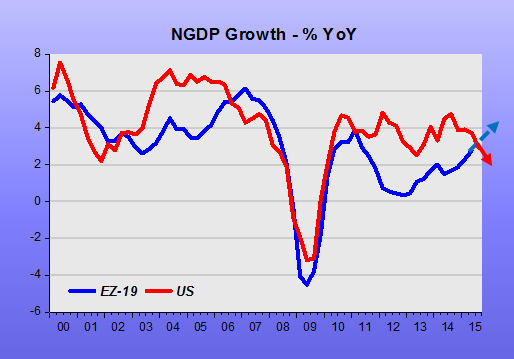 But what we seem to have is a two-speed Eurozone: The “do-well” North and the “flailing” South. The charts indicate that the ECB monetary policy has “discriminated” against the South. That could be indicating that the South does not satisfy the conditions to be part of the monetary union. In that case, problems will only get worse with time! The ECB will not change strategy, even if that means marching towards and falling-off the precipice! The European Central Bank can’t change the fundamental goal of its monetary policy, even in times that call for extraordinary measures, said European Central Bank Executive Board member Yves Mersch in remarks published Monday. The ECB´s target is an inflation rate close to but slightly below 2%. From 1999 to 2007 they did an almost perfect job, with inflation averaging 2%. Over the last few years, however, inflation has been on a downtrend and has recently even become negative! The chart shows what happens under the IT and PLT alternatives. 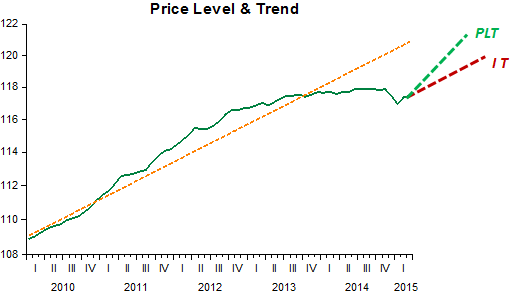 Given that the price level has fallen significantly below the 2% trend line from 1999, if, as Mr Mersch prefers, the ECB keeps to its IT strategy, the price level will be permanently lower. This means that the ECB will not be ‘penalized’ for having missed the inflation target for a long time. It´s sufficient that from now on it hits it! Adopting a price level target, on the other hand, would force the ECB to offset its previous error. Temporarily, inflation would be higher than 2%, which, in any case, is exactly what´s needed! It would be even better if, instead of a price level target the ECB adopted an NGDP level target, but that would be asking too much from such a conservative body. 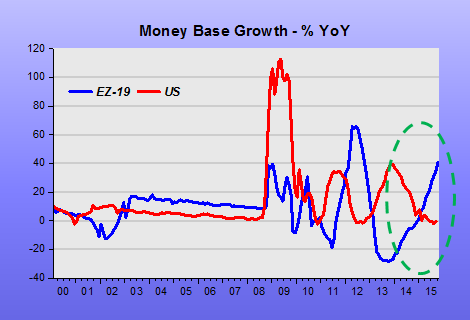 I made the case in my last post that the Eurozone crisis was largely a monetary policy crisis. That is, had the ECB lowered interest rates sooner and begun its QE program six years ago the fate of the Eurozone would be more certain. Instead, it raised interest rates in 2008 and 2011, waited until this year to begin QE, and allowed inflation expectations to drift down. In short, had the ECB been more Fed-like the Eurozone crisis would have been far milder. 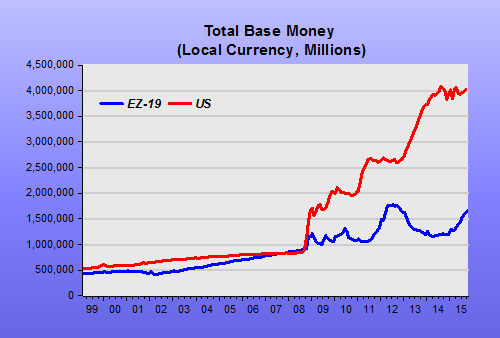 This begs the question as to why the ECB failed to act more Fed-like. Why did it effectively keep monetary policy so tight for so long? For that question he provides a long answer. I´ll boil it down to two panels. 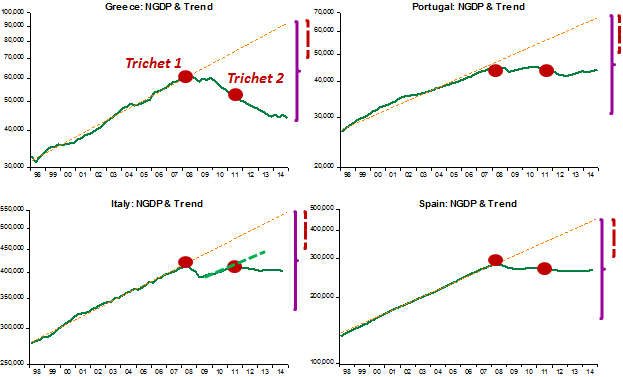 In panel 1 we have the behavior of NGDP relative to trend in 4 “core” countries (you may consider France “borderline”). From this panel one could infer that the ECB (led by Trichet at the time) was setting policy in order to keep Germany, and only Germany, close to trend. When he increased rates in July 2008, Germany was the only core country above trend. 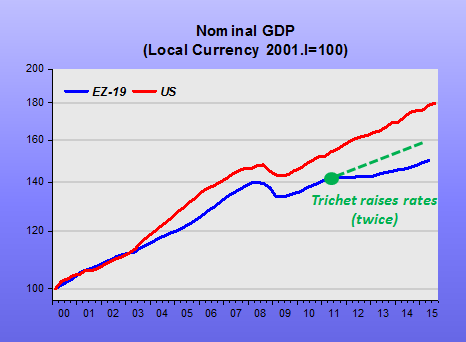 In April and July 2011 Trichet raised rates again. Why? Because Germany, and only Germany, had climbed back to trend! The negative effect of the 2011 rate rise was stronger in France than in the other core countries. 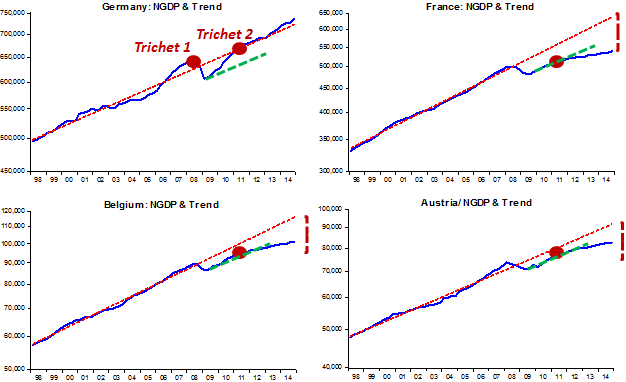 France was on a “slow train” (compared to Germany) back to trend (green dashed trend line). Trichet, a Frenchman, threw France “off the train”! Greece was “murdered”! Italy suffered with the 2001 rate rise. It was on the same “slow train” as France, but got ejected! The amount of monetary tightening experienced in the “periphery” was an order of magnitude stronger than the tightening experienced by the core countries, and in Greece, it was about double the tightening experienced by its “peers”! Bottom Line: “This is not a monetary union“. As is, the euro is unworkable.